Tara and I had a great and productive time in Rome, Italy last month. Not only did we have time to concentrate on us without the kids, we also got to make a mission scouting trip out of it. 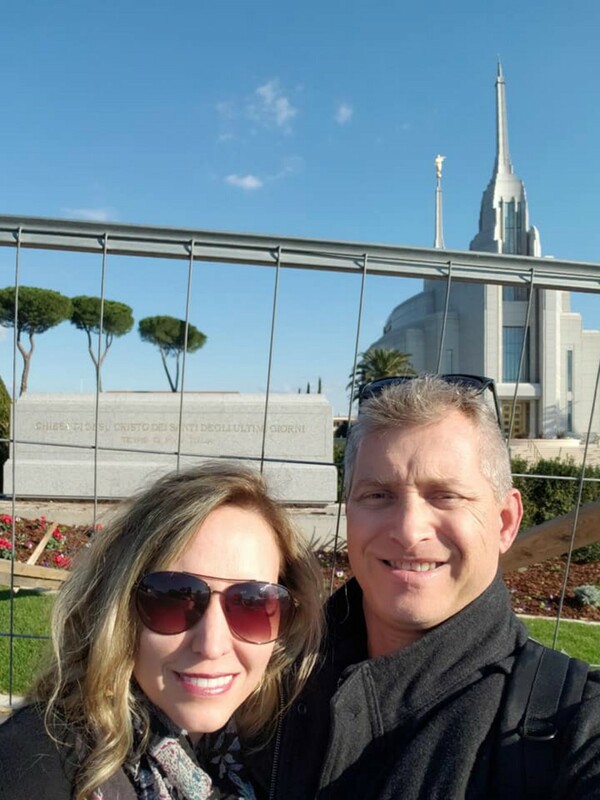 We visited the nearly completed LDS temple. It was fenced off and the lone security guard was on his phone the whole time and obviously not interested in talking with us. It was interesting to see a couple things there. First, the public sign off the road indicating the religious center uses a cross. I found out later that this is standard for any church in Italy. 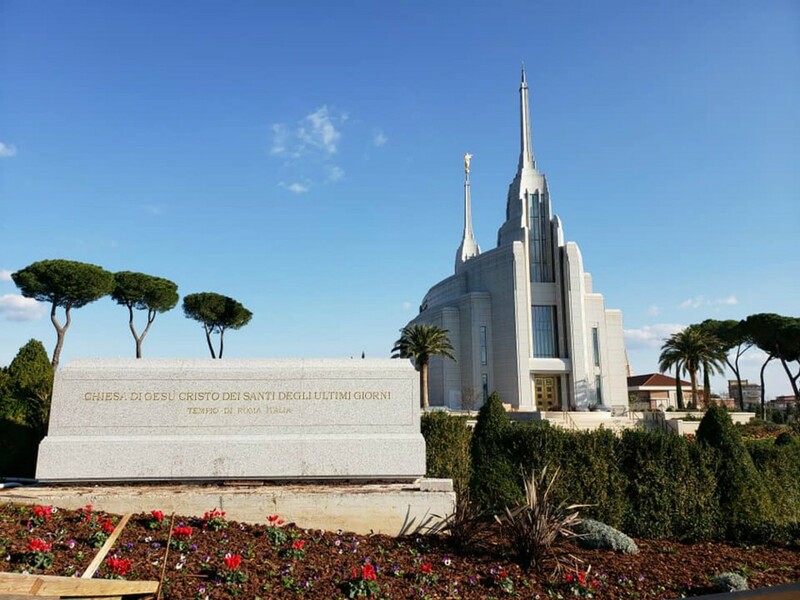 It’s interesting, since LDS don’t use the cross on their buildings. Second, that is now generally speaking, since the door of the temple facing the street has a subtle cross on it. The horizontal line is below the top two windows, but not underneath any of the other windows below. You may watch the video of it HERE and form your own conclusion. The next day we went to Rome Baptist Church and introduced ourselves to the congregation. Afterwards, Pastor Dave Hodgdon, whom I have been in correspondence with since July/August, had us stand with him outside to greet the congregation. Later that night, Dave and his wife took us out for dinner. After the Sunday morning service, I met a guy named Adriano, who was so excited to meet us, since he lives real close to the LDS temple and has been wondering how to counteract it. I was also very excited to meet him, since he works as a translator! We corresponded when I got back home, and it looks like he’ll hopefully be translating all my tracts on my MormonInfo.org Tracts page. We gave the church about around 400 of the new Temple Opening Papers and about 50 DVDs. Dave watched the video that afternoon and really enjoyed it. These papers and DVDs will be helpful for the congregation, most of whom speak English, but most of the people there in Rome don’t speak English. The papers could be translated, but it’s not really cost effective. This is why I am looking into having our Tracts page translated. I would like to come back the middle of February for the last week of the temple opening with possibly my dad, who is interested in going. Would you please get me back there? In addition, 2019 should be a very busy year for travel to Temple Openings. The dates haven’t been released yet, but the following temples are slated to open this year in this order: Oklahoma City, OK, Memphis, TN, Raleigh, NC, Baton Rouge, LA, and Oakland, CA. Please partner with these evangelism opportunities as well through prayer, financially giving, and even your mileage points may be applied for either my air travel or an Airbnb. These mission excursions aren’t cheap, but God provides through you if He wants me there. I’m asking you to not only invest in me, but all those who will be warned about the LDS Church. We had Janna Page share her story last month. Please watch the video and see the pictures on our MeetTheExMormons.org site. There was a revealing video that the LDS Church used to have online called “Decision by Faith—Jennifer.” For whatever reason, it was taken down. Our board member Brett Kunkle happened to have a video copy of it, so I stuck it up on our YouTube page. Now it’s called “Mormon Jennifer: ‘I Wasn't Thinking; I Was Feeling.’” You may watch this short clip HERE. If you sign up to become a monthly partner of our ministry, I will gladly send you a signed copy of our new book Sharing the Good News with Mormons at no cost. If you simply want to buy it, I will sell a signed copy for $18 (includes shipping and handling within the United States). Amazon lists it for $15.76 (Prime) without shipping and tax. All proceeds go to support CCU, which is a 501c3 non-profit organization. [From one of my students in the online class on Mormonism…] Which version of the Bible is the most correct? I only have the LDS King James Version. I don't want to read one with JS's changes. [I replied:] I'd recommend ESV, NIV, or NASB. Try this. [She replied:] Thanks for the info over the past few weeks. It has furthered my search for truth and I am a believer in Jesus Christ as my Savior. I no longer believe JS to be a prophet of God. My story rings true with so many others. I was a Gospel Doctrine teacher, and the more I studied materials for Church History lessons, the deeper I delved into research on line. My research which has lasted for four years, has led to a collapse of any faith I ever had in the JS story and the restored church. I've been sad, depressed, had sleepless nights and angry days. Angry that I had been deceived all my life by leaders at the top of the church who knew the truth, but have chosen to perpetuate the lie. How can educated, intelligent people believe that JS actually used rocks in his hat to translate ancient records? Polygamy, racial discrimination in the priesthood, misogyny, financial secrets, billions of dollars for temples & genealogy for redeeming the dead? Christ redeems us, not ordinances made up by JS. I'm so deeply entrenched in family traditions. My ancestry goes back generations to England ancestors traveling to America, crossing the plains, etc. I don't know any other life besides being a "Mormon". Social connections, family, neighbors & colleagues. I could never "come out of the closet" so to speak, because of family and social pressures. I'm the matriarch of the family now with children, grandchildren, whom I have influenced to go on missions, go to the temple, live a good Mormon life. You can see why I've been angry and depressed many days. In my heart, I know Christ is my Savior and I will read the true scriptures as soon as I purchase a copy of one of the Bibles you have referred to me. Thank you for your site and excuse the rant. It feels good to write it out. Good luck in your ministry and God Bless. [I replied:] Thanks so much for writing and letting me know what's been going on with you. You're welcome to write as much as you want. I'm glad it's cathartic for you! I understand what you're going through and on one level I'm really sorry you have to go through this, but on another level, I'm overjoyed that God has led you out and to Himself. Better late than never! He has saved you for a reason and that's not to be silent and comfortable. I pray that He will use you in tremendous ways for His kingdom and that many others may experience truth as you have. Remember 2 Cor. 1:3-7: "Praise be to the God and Father of our Lord Jesus Christ, the Father of compassion and the God of all comfort, who comforts us in all our troubles, so that we can comfort those in any trouble with the comfort we ourselves receive from God. For just as we share abundantly in the sufferings of Christ, so also our comfort abounds through Christ. If we are distressed, it is for your comfort and salvation; if we are comforted, it is for your comfort, which produces in you patient endurance of the same sufferings we suffer. And our hope for you is firm, because we know that just as you share in our sufferings, so also you share in our comfort." And also my dad's favorite verse: "And after you have suffered a little while, the God of all grace, who has called you to his eternal glory in Christ, will himself restore, confirm, strengthen, and establish you" (1 Pet. 5:10). [She replied:] Thank you, that means a lot. I will pray with those scriptures in mind. So glad to find you and your ministry on the internet and what a lovely family you have! I don’t know if you remember me from Biola University, …I went on a Utah missions trip led by you almost 20 years ago. …My husband has been pastoring a church …for nearly 13 years. We are having issues with a few members in leadership that believe Mormons are Christians and believe we can partner with them in ministry. Last Sunday the local Mormon Bishop showed up on the doorstep of our church to try and convince my husband how we are the same. We have another member downloading information on what Mormons believe and how they are Christians. They want this Bishop, who is a lawyer to come and present at our council meeting. Help! I found your site online doing research about "God's Compelling Witness: The Book of Mormon Oct 2017 General Conference". I've read Walter Martin's Kingdom of the Cults and i've also witnessed to a lot of Mormons and am fairly well versed on these subjects (but not an expert by any means). So here is where I am. I've been witnessing to two Mormon missionary girls who have returned to us with the document "God's Compelling Witness" and Hyrum Smith's "Why 1820" devotional. I was wondering if you had any bullet points concerning the "compelling witness" and just wanting your advice in general about talking to these girls. Briefly, when we talked the first time I talked alot about Islam and it's claims and the way Muhammad allegedly received his "revelation" and then talked specifically about Islam's view of Jesus and how much they missed, especially when we have documents that were written in the first century outlining the biography and teachings of Jesus. "why do I need to pay any attention to Islam's Jesus, when it's obviously not the same Jesus as the one in the New Testament" was my question to them. I did allow them plenty of time to talk and I am genuinely interested in where they are coming from and what their views are. Both were raised in Mormonism. Cali and Utah mormons. We talked about some other things, and I basically asked the same question concerning their books and prophets and said this was a major hindrance to me believing Mormonism, just as it is a major hindrance to my believing Islam. So, they have dropped off literature (mentioned above) and are going to come back. Any advice and prayers would be great. I've had male mormon missionaries coming back to my house once so many times that the last time they brought an adult "bishop" or something who told me I needed to convert or leave these poor kids alone. Those poor kids really seemed to like me, but oh well. I try to stay inquisitive and ask a lot of questions. I did also act like I was open, but iI wasn't. I'm not sure that was totally honest of me in my approach, so I'm trying to be a little more straightforward but want to keep the conversation going as long as possible so I could hopefully put a stone in thier shoes and give them something that will bug them into Christ's arms. Any advice and prayers would be appreciated. [I replied:] It sounds like you're doing a great job! I don't have points on the material you mentioned, but this will be of help to you. Keep questioning, praying, and loving them well! Dude, read your newsletter (or at least part of it). The LDS are getting rid of pageants?! What the flip? Is there a back story to this? It seems like a "business" decision. Is pioneer day still a thing or are they getting rid of that too? [I replied:] No, the only ones in trouble are Manti and Hill Cumorah due to all the preachers. So theoretically, if we get enough at other venues, they'll shut those down as well. …we loved the news letter and are praying for you. God bless you and keep up the good work. That's crazy to hear about the pageants! Keep up the good work! LDS pageants being fazed out!!? Wow I hadn't heard that. That is a victory. They were feeling your impact and worried. Praise God. And thank you! I love the information you have given on how the Mormon Church is false. I was sucker in until the day I woke and said, this crap isn’t right.